The Sterilite 6 qt shoebox is a very popular clear plastic shoe box. Use a Sterilite shoe box for shoes or just about anything from office supplies and kids craft gear. Use a clear shoe box to store medicine or make-up. The advantage of using a clear plastic shoe box is you’ll be able to see and find items easily. Each of these clear plastic shoe boxes come with a white snap-on lid that are designed for stacking. 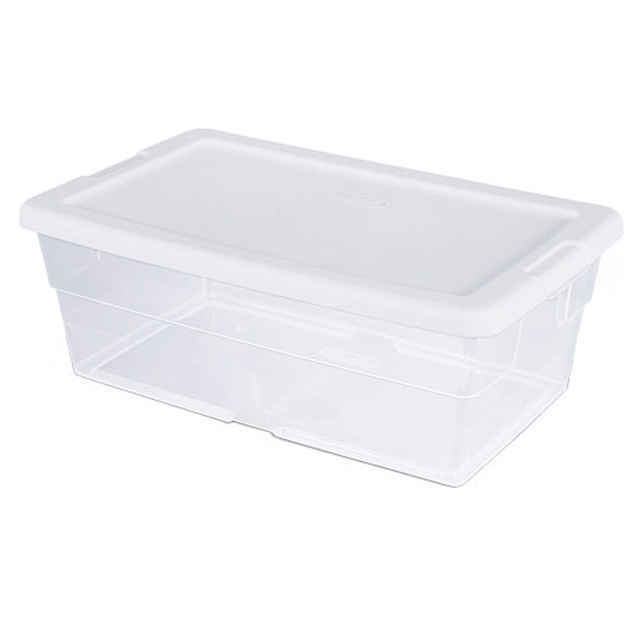 Get a head start on your organizing project with the Sterilite 6 quart shoebox. This clear plastic shoe storage box comes in a set of 12 and you can take advantage of discounts by ordering plastic shoe boxes in bulk. The Sterilite 6 qt shoebox is also the ideal size for the Operation Christmas Child shoe box donations and is made of heavy-duty quality plastic.